Synopsis: This is the third in Peter H. Reynolds “Creatrilogy” of books that began with The Dot and Ish. All three books celebrate the ability of all children (and adults) to be creative. For a Perfect Picture Book review of Ish, please see Joanna Marple’s post from January 2012. For a Perfect Picture Book review of The Dot, please see Pat Tilton’s blog today as well as Heather Newman’s (celebrating International Dot Day). In Sky Color, Marisol is known in school and in her family for her artistic ability. When her teacher suggests the class paint a mural for the school library, Marisol is eager to begin, and volunteers to paint the sky. But – there is no blue paint. How can she paint the sky when she has no blue paint? Throughout the book, she learns that the sky isn’t always blue, and that there are many colors that are sky color. The mural is, of course, a work of art. Activities/Resources: A good activity to pair with this book would be to go on a Look Closely Walk with kids. Encourage the children to look closely at everything around them. What color is the sky? Is it a lovely clear blue? Are there grey clouds? Is the sunset turning the sky all sorts of beautiful colors? What other things can they see that are unexpected colors? How about the reddish purple leaves on that bush? What about that bright pink door on the house across the street? Do things have to be the colors we expect them to be? NASA has a wonderful resource on how to read sky colors, and what the different colors mean from a scientific point of view. There is a Sky Color Facebook Group page where people are invited to post photos of sky color which they have taken. Peter and Paul Reynolds’ website FableVision has a downloadable educator’s guide (note: one has to provide name and email address information, but the guide is free). And … every September 15th-ish, children and adults can get involved in International Dot Day, which is a chance to celebrate creativity to the full. Have you made your mark? Availability: Readily available in hardcover (released August 28, 2012). Also available in a Creatrilogy boxed set with The Dot and Ish. Definitely, you need to check out this book, Angela. It’s amazing the sky you can color with no blue paint! Peter H. Reynolds is delightfully creative, and I think you’ll enjoy his books. What a great way to roll from reading into a hands on project! Get those little (and big) minds thinking on many levels. As Susanna, I’d never read Peter’s books. All three are on my list now! Off to see what ISH is all about! Oh, Lori, it’s time you read Peter H. Reynolds! He has many other books as well, either that he has written and illustrated or that he has illustrated for other authors. I’m quite sure you will like this Creatrilogy. Sounds like a great book! Love the premise. I’ll have to look for it. Thanks, Beth! It is a delightful book, and has such a good message for kids (and adults). Thanks, Tina! Thank you for the link, Beth! I didn’t realize that there was a third book in the series, so I will have to track it down as THE DOT and ISH were such a success here. I love your suggestion to take a Look Closely Walk. We just started an outdoor skills class and that’s exactly what the instructor had us do with the different plants he identified on the walk. Great post! this one was just released on August 28, so it is very new! The outdoor skills identifying walk sounds great! Thanks, Heather. This looks great, Beth. I’ve read a lot of his books, but not this one. I’ll keep an eye out for it at the library. This book was only released a couple of weeks ago, so it’s not surprising you haven’t encountered it yet. Hope your library gets it soon. Thanks, Carrie! Beth, lovely review of Sky Color. Hot off the press! So happy you reviewed it today to complete the Creatrilogy of all three powerful books. I read it and particularly enjoyed Marisol’s gallery — the refrigerator. The activities you suggested are excellent. Thanks, Pat. It’s good to be highlighting Peter’s books! 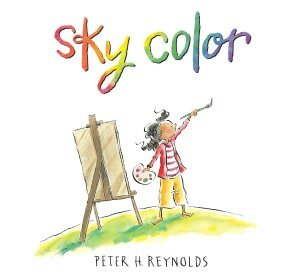 Another Peter Reynolds book. I am getting this one for sure. I love Dot and Ish. Can’t wait to read it. Thanks for telling us about it, Beth! I must admit that Ish is my favorite, but I love and applaud the entire Creatrilogy. Thanks, Penny! Thank you for linking, Beth. I went to the main bookstore in Cambridge today and looked for this and several other well-known picture books and was so disappointed with what was available. I love Dot and Ish and this looks just as worthy! Thank you for the review. Beautiful review. Thanks. I have this book on my TBR list, look forward to reading it. Nice job with the activity links. Thank you, Darshana! I’m quite sure you’ll enjoy the book. Sounds right up my street, thanks Beth. I’m sure that both you and Josie will love Mr. Reynolds’ books, Erik! This is the perfect review for Dot Day-ish. I hadn’t heard of this third in the trilogy, but we’ll have to check it out. I do love that you listed a NASA resource. It’s brand new new new! And I thought of you when I found the NASA resource. Thanks, Kirsten! I love that this book has so many resources. What a great addition to the series! It’s perfect to complete the trilogy, jennifer. And resources for the sky are all around us! We’ll have to check this one out.